This is from a long time ago. We kept having orioles on the hummingbird feeder. They used to pick the yellow flowers off the hummingbird feeder. So we bought them an oriole feeder. But they like the hummingbird ones better. The oriole feeder is really difficult to clean. Could be why they like the hummingbird feeders better. They probably taste better because they get cleaned better. The hummingbird feeders can be taken entirely apart. So I am able to make sure I get it ALL cleaned. Since the orioles pick the flowers off the hummingbird feeders so they can get to the sugar water, we just leave one or two off now. Here you can see a hummingbird looking at the invader. Can you see him? Ya kind have to look closely. Hummingbird and oriole for the Friday Photo. This entry was posted on July 21, 2017 at 4:36 pm	and is filed under Birds, Friday Photo. 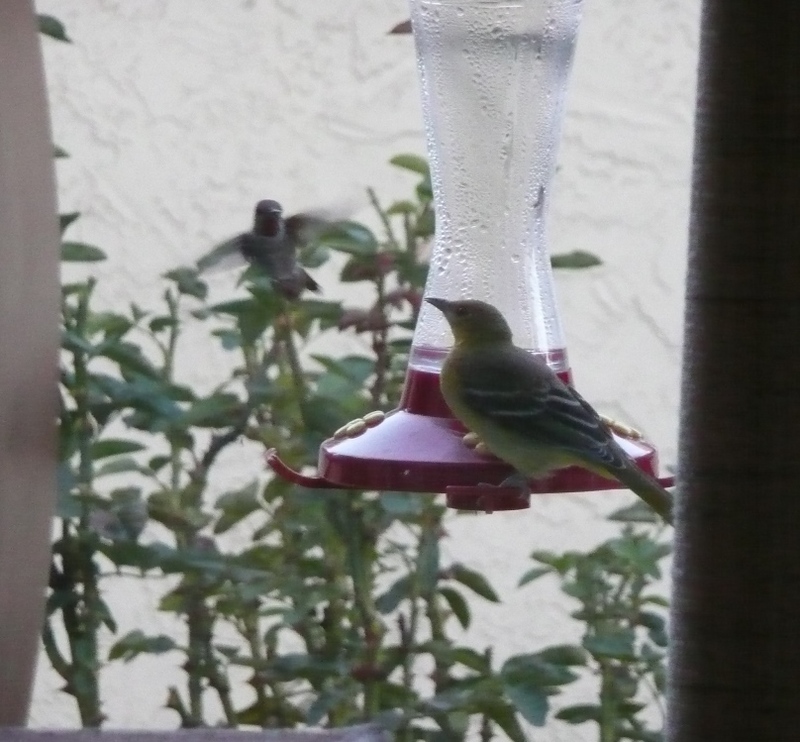 Tagged: Friday Photo, hummingbird feeder, Hummingbirds, oriole feeder, orioles, yard brids. You can follow any responses to this entry through the RSS 2.0 feed. You can leave a response, or trackback from your own site. Animals amaze me how smart they are and they’re also funny. It’s funny how the Orioles like the Hummingbird feed better. Let me know if you find out. Did you try the link I sent you? If so, How did it work? I think the whole on the hummingbird feeder IS bigger, but it is also farther away from the nectar. The oriole feeder is flat. I sent it in last message. The link I wanted you to try was: http://crystalsphotobloggingsite.wordpress.com let me know if this link works please. Yup. This works. Just like I said the link on the side of your blog works, but the link in your post does not. I think it is because of the apostrophe. Oh, I see now. You commented on your blog post with your link. So . . . it is the link in your post that does not work because it has an apostrophe in it. Which post of mine? Or was it on 1 of your posts? Then I found it and fixed it. It should work now. If it doesn’t please let me know.